Lee at the VMA Awards. A descendant of Confederate General Robert E. Lee, the Rev. 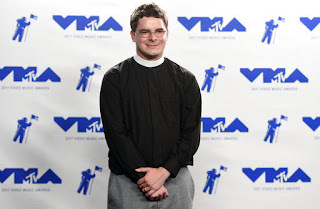 Robert W. Lee IV, has stepped down as pastor of Bethany United Church of Christ in Winston-Salem over remarks he made during the August 27 MTV Video Music Awards (VMAs) in which he praised the Black Lives Matter movement. He was introducing the mother of Heather Heyer, who was killed during demonstrations over a Robert E. Lee statue in Charlottesville, Va. Some members of his church were outraged by his politics, while clearing remaining quite comfortable with their own: "A faction of church members were concerned about my speech and that I lifted up Black Lives Matter movement, the Women' s March, and Heather Heyer as examples of racial justice work," he said in the statement explaining his resignation. Lee also issued an apology to church members for causing them pain with his remarks on MTV. But he said he continues to "strongly support" removal of monuments to his ancestor and other Confederates. Lee, a recent graduate of the Duke Divinity School, was only just appointed pastor of the church in April.